Dated the 27th February, 2019. 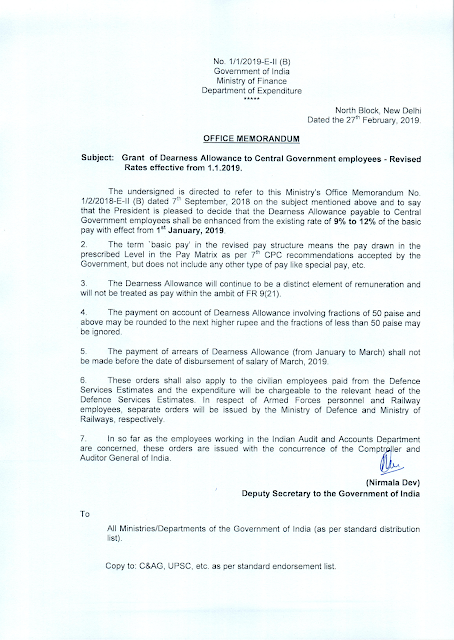 Subject: Grant of Dearness Allowance to Central Government employees - Revised Rates effective from 1.1.2019. The undersigned is directed to refer to this Ministry's Office Memorandum No. 1/2/2018-E-ll (B) dated 7th September, 2018 on the subject mentioned above and to say that the President is pleased to decide that the Dearness Allowance payable to Central Government employees shall be enhanced from the existing rate of 9% to 12% of the basic pay with effect from 1st January, 2019 . 2. 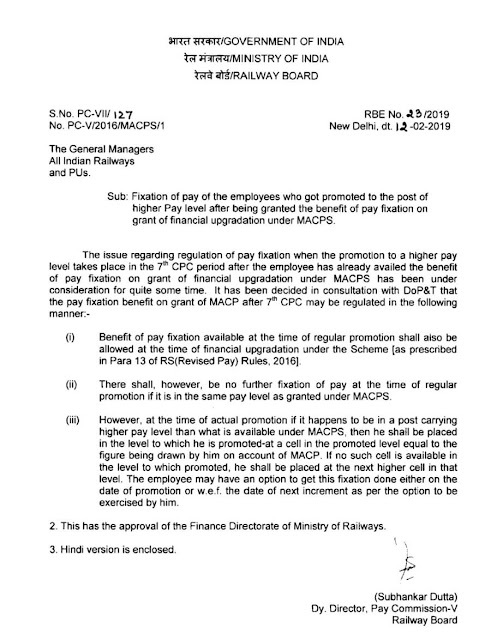 The term 'basic pay' in the revised pay structure means the pay drawn in the prescribed Level in the Pay Matrix as per 7th CPC recommendations accepted by the Government , but does not include any other type of pay like special pay, etc. Captain M. Jayantha Kumar, (PS Gr. B officer of 2009 batch) who was on deputation from Karnataka circle to Army in 1CBPO committed suicide at his residence in the afternoon of 22/2/2019. He was 47 years old and residing at Vasant Vihar Delhi. His family is at Bangaluru. He is having two school going kids. It was told that suicide note was found near his body. 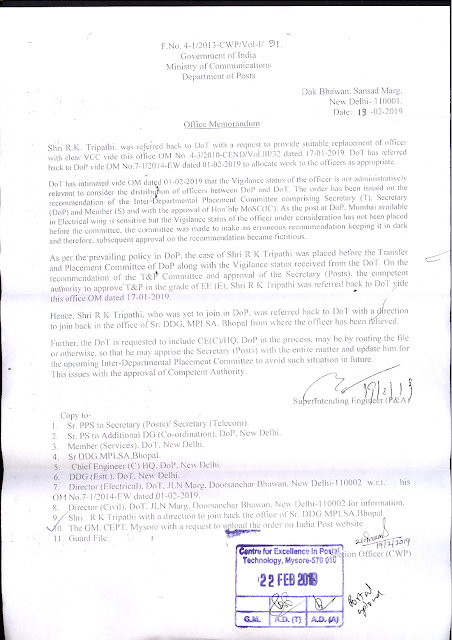 Delhi police is investigating the matter under section 174 of CrPC. Prima facie it appears that he was stressed. In one page suicide note, he wrote "I am honest and innocence, but I will not allow them to misuse me anymore". I love my family. happy birthday, my son". Captain M. Jayantha Kumar was very talented, knowledgeable, brilliant, loyal and dynamic officer. 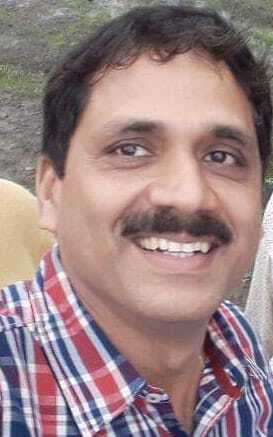 He worked as Circle Secretary for IP/ASP Association for Karnataka Circle. He passed PS Gr. B examination in the vacancy year 2009 and eagerly waiting for his regular JTS Gr. A promotion. He was the first person in the cadre who raised the issue regarding discrimination between Inspector Posts and Inspectors working in CBDT/CBEC in CWC Meeting held at Mulki (Karnataka) in the year 2005 and thereafter he alone filed OA No. 211/2007 in Hon'ble CAT Bangalore Bench. Hon'ble CAT, Bengalore Bench has disposed of this OA on 27th July 2007 with common judgement along with another OA 424/06 that "Govt. had constituted the VI Pay Commission to set right the anomalies and to recommend Pay revision in case of Central Govt. employees, and said commission had not submitted its report at that time, and directed respondents and applicants to take up the issue immediately before the VI Pay commission for consideration with the copy of its order". His action has shown us the path to get GP Rs. 4600/- to IP cadre. 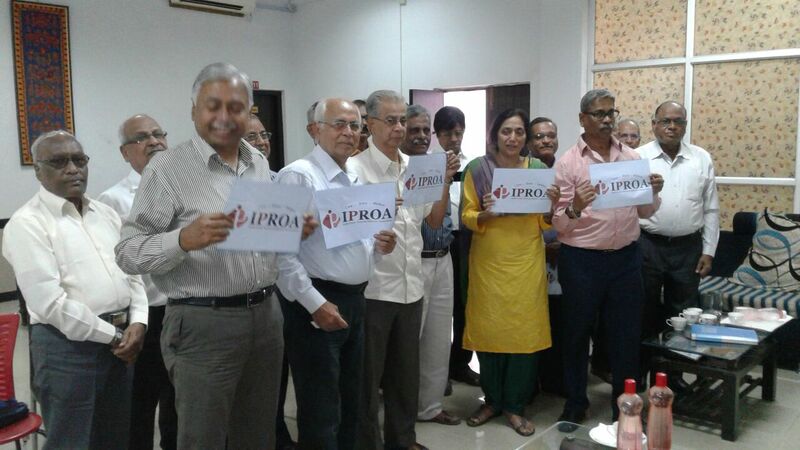 As every knows that thereafter at Association level we fought and achieved the goal to get GP of Rs. 4600/- to IP cadre w.e.f. 1/1/2006. The real hero is Mr. Jayanatha Kumar. He was closely associated with IP ASP Association and always took active part at each level. He has told to his few friends that after getting regular JTS Gr. A promotion he will go back to his parent circle. Our heartfelt condolences to the family of the departed soul. May the soul achieve moksha. God may give sufficient strength to the family of the departed soul to bear the loss. 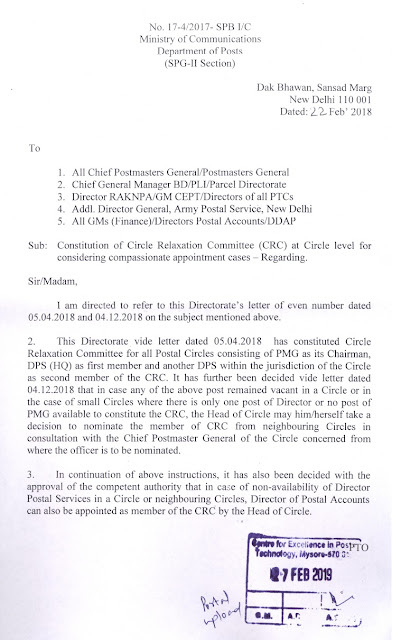 The Directorate has issued a memo regarding merger of Postmaster Cadre with General Line cadre on 25.02.2019 which we may call as a Black Day not only for Postmaster Cadre but also for the entire Department of Posts. The proposal for merger of Postmaster Cadre with the General Line clearly shows the Dictator attitude of the dealing Administration and it is undemocratic step taken by the Administration as the opinions of the main stakeholders i.e. Postmaster Cadre officials were not taken into account before formulating these unjustified proposal. As we are all well aware of the noble intentions of the Department behind creation of a separate cadre of Postmasters was to head the key Post Offices and improve the productivity of the Department. Hence, the Department conducted LDCE (in 2011, 2012 and 2013) and chosen young talented, professionally skilled staff on the basis of merit and posted to the key Post Offices. After creation of the Postmaster Cadre the Department became able to implement the several technological projects successfully like SAP, Core Banking, McCamish etc. which was very much essential to compete with the private players and to improve the productivity. Now all of a sudden the Department has announced its unjustified decision of merger of Postmaster Cadre with the General Line which appears as a decision taken by one of the Feudal King who is known for his whimsical decisions. Friends, we have chosen and joined this Cadre after looking at the motivational letters from then Directorate. Expecting good prospects for the newly created cadre we have lost almost 9 precious years in this cadre without any financial/ promotional benefit. This is because of the negligence of the dealing Administration who never cared for our opinions and thought of providing minimum prospects for our cadre. The Administration has left us as orphans after creation of this cadre. The Administration has well utilised our talent where ever needed and left us like use and throw items. The Administration has never listened to our issues though we have prayed many a times. We are totally betrayed by the whimsical acts of Administration in merging the cadre with the General Line which was unilaterally taken and is not acceptable. 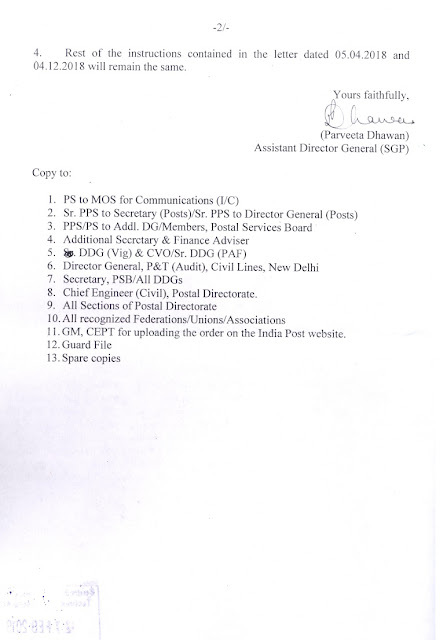 The Administration did not incorporate the issue the merger of the Postmaster Cadre with the General Line as agenda for the meeting held on 20.12.2018 and the Administration has unilaterally taken the decision of merger which is undemocratic and betrayal of the rights of the officials of our cadre and against the Natural Justice. I hereby request all our cadre officials to give their opinion about such unilateral decision taken by the dealing Administration and send their opinions about the next course of action to our CHQ email id : aiapcchq@gmail.comimmediately. 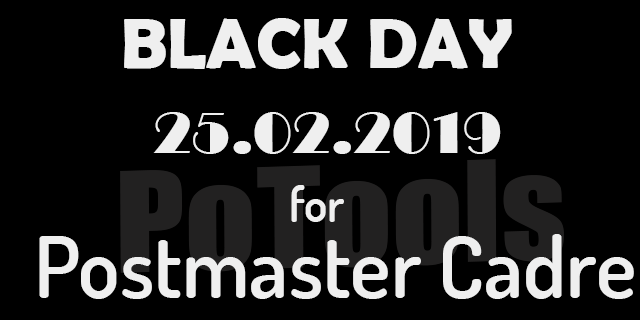 Sub: - Decentralization of Postal Accounts – Protest day on 27.02.2019 – Regarding. I wish to bring to your kind notice the anguish of the employees of the Postal Accounts over the decision to decentralize the Postal Accounts. It is very unfortunate that such a decision which is having far reaching consequences on the structure of the Postal Accounts and its functioning has been taken without taking the views of the Staff Side into consideration. This Association is observing the protest day on 27.02.2019 to bring to your kind notice the agitated feelings of the Postal Accounts Staff. In the year 1987, when the use of technology was in the nascent stage, the Postal Department has decided to deploy the Staff of the Postal Accounts to the field units. As that experiment was not successful, it was withdrawn. Realizing fully well that the centralized PAO set up can only effectively plug the financial loopholes; it has been assured time and again that there will be no decentralization of the Postal Accounts. I submit that, the Department has deployed the most modern IT tools and this will obliterate the need for any physical deployment of personnel. The proximity of the maker and checker will reduce the effectiveness of the checks and it will neither serve the interest of the Department nor the Staff. Hence, I earnestly request you to kindly reconsider the decision of deployment of manpower from DAP to Head Office / Divisional Office for pre-check of all kind of vouchers and concurrent audit in the post CSI scenario. I also request you to kindly direct the concerned to initiate a dialogue with the Staff Side immediately. 1. 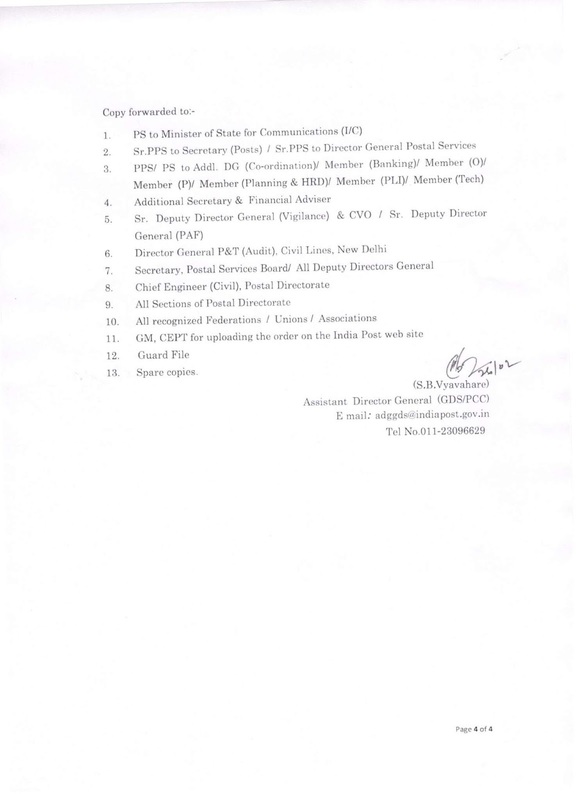 The JS&FA, Department of Posts, New Delhi for necessary action. 2. 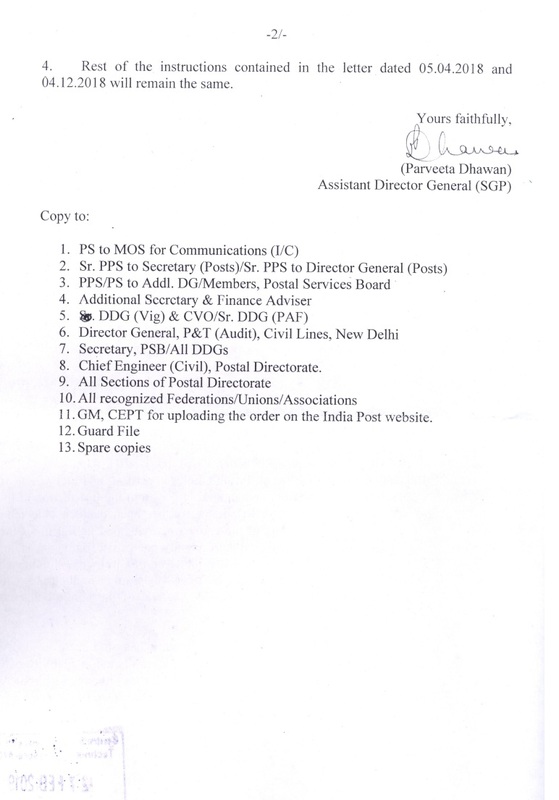 The Sr. DDG (PAF), Department of Posts, New Delhi for necessary action. 3. 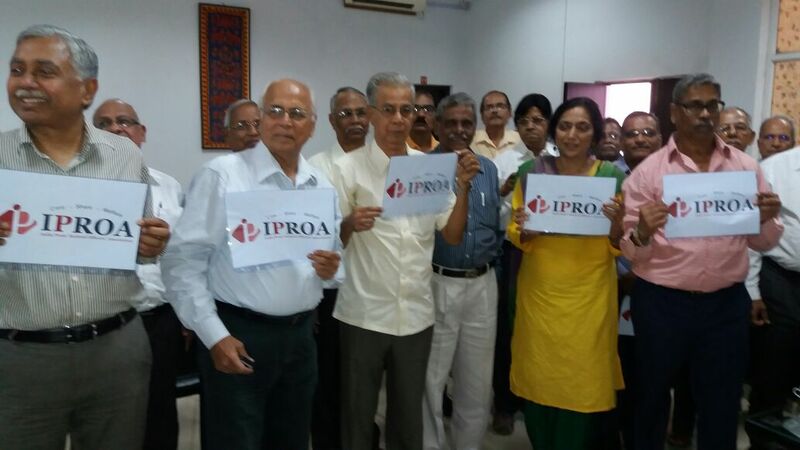 Secretary General, NFPE, North Avenue, New Delhi. Dated the 21st February 2019. With reference to the above mentioned subject the undersigned is to advise all the private hospitals empanelled under CGHS to ensure that CGHS beneficiaries referred by Govt. Specialists/CGHS Medical Officers are provided OPD Consultation facilities by Specialist and ensure that they shall not charge more than the CGHS Consultation charges. 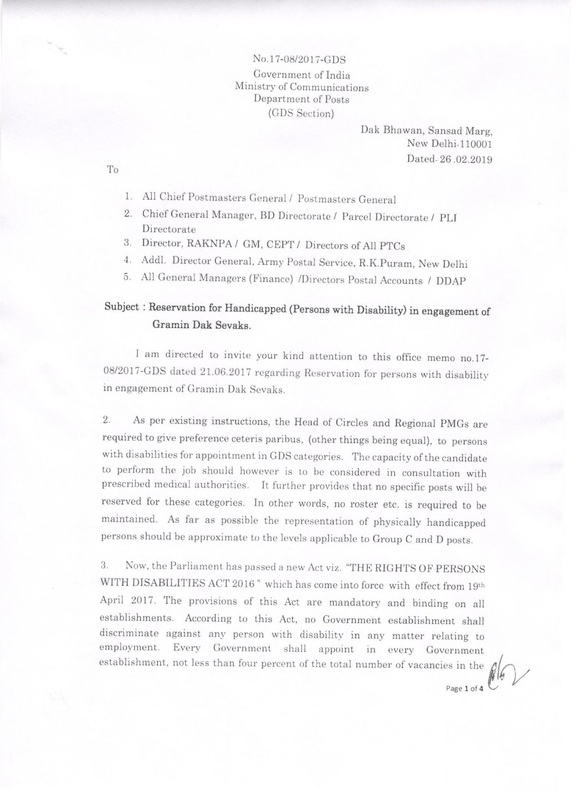 Subject:Regarding New Inclusion of additional Professionals under the Extended Clientele list of Procurement of PU/RPLI Policies under the Divisions of Kolkata Region. Certification of the Educational Qualification (eg Certification of B.Sc/B.Ed Pass out Certificate in the name of the Proponent). A copy of Self Declaration with self attestation, stating the credentials/data and the monthly income. In case the proponent is employed, the details of the Organisation wherever he/she appointed should be mentioned. 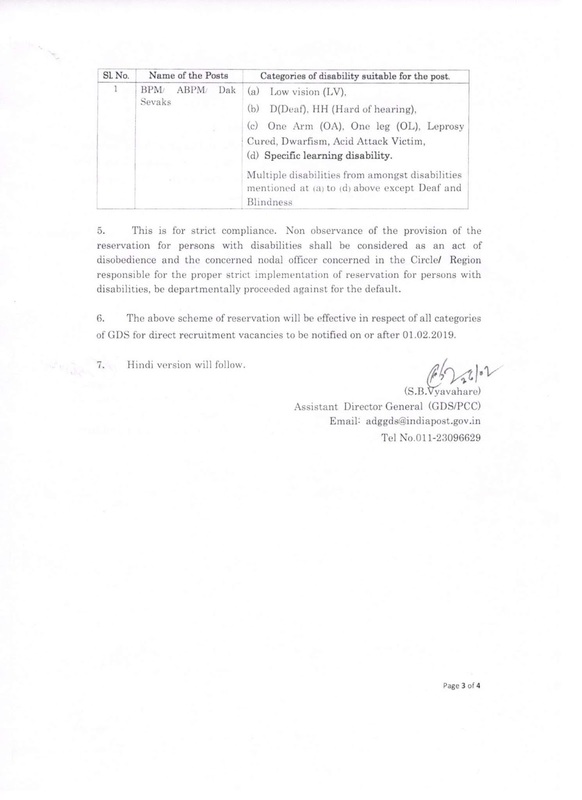 A copy of the appointment letter/employment certificate may be obtained (Optional). Salary slip may also be obtained, if available. 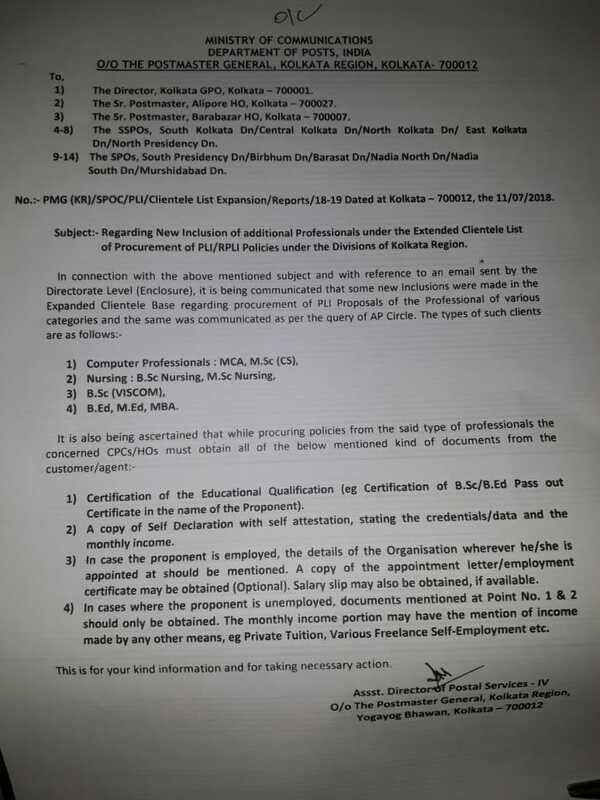 In cases where the proponent is unemployed, documents mentioned at Point No. 1 & 2 should only be obtained. The monthly income portion may have the mention of income made by any other means, eg Private Tuition, Various Freelance Self-employment etc. Purchases on recommendations of an ENT specialist? b. The ENT specialist shall then recommend a hearing aid on basis of Audiometric and Audiological assessment, specifying the type of hearing aid most suited for the Beneficiary. e. An ‘undertaking’ by the beneficiary that he has not been reimbursed the cost of hearing – aid in the preceeding five years is to be submitted. The cost of hearing aids shall include all taxes in including VAT and shall carry 3 year warranty. The cost of Analogue BTE /Digital BTE/ITC/CIC type hearing aid shall also include the cost of hearing mould. Who are already not suffering from any chronic ailment like Diabetes Hypertension Heart disease etc. TRAI’s new framework for channels and DTH providers came into effect from February 1. Though the transition was smooth and there was no blackout, the new rules require subscribers of DTH and cable to choose channels and packs. The new rules are aimed at offering “freedom of choice” to consumers and give them “direct control” on their monthly bill for television services. With the new rules in place, subscribers can select only the channels they like. One can also remove channels they do not wish to watch from their existing channel pack. 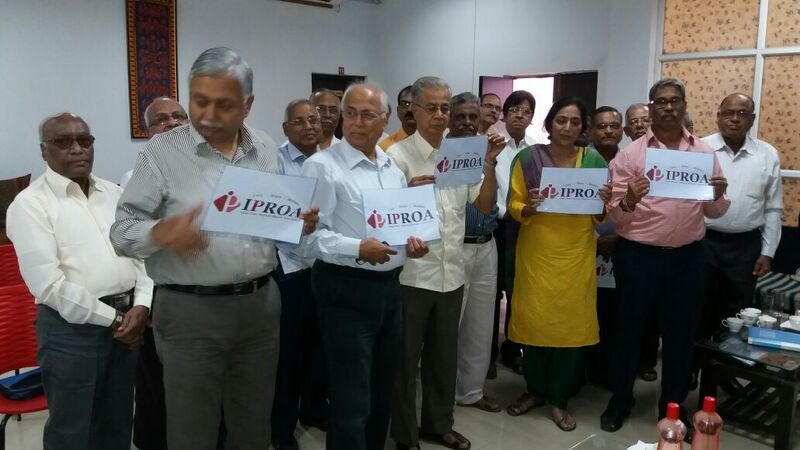 So, what impact will TRAI’s new rules have on the monthly bill of subscribers? We take a look. The base monthly fee for 100 channels is common across all operators, which is Rs 130+18 per cent GST and it comes to around Rs 153/-. All subscribers will have to pay Rs 153 as a base fee for up to 100 channels. Those who add more than 100 channels to their pack will need to pay Rs 20 extra for 25 channels. This is the network capacity fee, which will be charged extra to the Rs 130, plus taxes. TRAI has fixed the price of channels to Rs 19/-. However, do note that one High Definition (HD) channel counts as two Standard Definition (SD) channels so a higher price could be reflected for some channels. Several channels including from Doordarshan are free-to-air so subscribers will not need to pay for them. DTH providers like Airtel, Dish, Tata Sky as well as cable operators have put out individual channel prices, which are inclusive of taxes on their website. Subscribers can choose individual channels to make their own monthly pack or choose from packs listed by providers. The curated monthly packs are based on the user’s TV patterns and the channels that they are currently subscribed to. Essentially, subscribers will be paying from Rs 150 plus minimum for the tier of 100 channels. For any special channels, people will have to pay extra. Subject: Request for vigilance/CBI enquiry into the death of Captain M. Jayanth Kumar PS Group B officer CBPO, APS, New Delhi. With due deference, Postal Officer Association wishes to bring to your kind notice, one of the unfortunate alleged suicide incident occurred in CBPO unit of Army Postal Services. On Friday morning, Captain M. Jayanth Kumar PS Group “B” officer of Karnataka Postal Circle now on deputation to CBPO, APS, New Delhi was found hanging from the ceiling fan in his Vasant Vihar staff quarter in Delhi. The members of this association are very upset on the untimely and unfortunate death of one of their honest, laborious, innocent and dynamic officer. As per information available with this association, Delhi Police have registered a case under section 174 of Cr.P.C and during preliminary enquiry recovered suicide notes from the crime scene. In the suicide note, as reported by Express News Service New Delhi dated 23-02-2019, officer was stressed as some people have misused his innocence. Though the publication is in brief and has not elaborated the position yet members of the association are of firm view that the officer was bold enough to face all the troubles and stresses of life which are adequate to rule out suicide theory. To confirm this averment, it is mentioned that the officer might have also mentioned the names of the people who allegedly tries to misuse his position to safeguard themselves in any of the probable departmental enquiry entrusted to the officer for investigation. Perusal of the press clipping and other information gathered by this association reveals that officer has not committed suicide but something fishy happened that is a subject matter of investigation by premier agency like CBI. The possibility of canteen scam to which he may be an investigating officer cannot be ruled out. If the officer who detect the scam are not provided any safeguard, then the day would not be far when such officer, fearing their personal involvement, would not dare to report and investigate particularly where such kind of sacrifice are required to prove honesty and his honour. In this unfortunate incident, we have not only lost our dedicated, brave, sincere and hardworking officer but also miserably failed to unearth the bad incident for which this association now expect that our department will take this case at appropriate level so that real culprit may be brought to fore. It is therefore urged upon to pass an order to APS authorities for immediate departmental vigilance enquiry at APS Directorate level on the points raised by the deceased officer in his suicide note linking it to the canteen scam inquiry if any to elicit the truth and to bring the real culprits behind bars. If their needs be and find wrongdoings department can ask for CBI enquiry orders to APS authorities. It is also requested to device safeguard measures for the officers conducting enquiries in order to avoid any such incident in future. 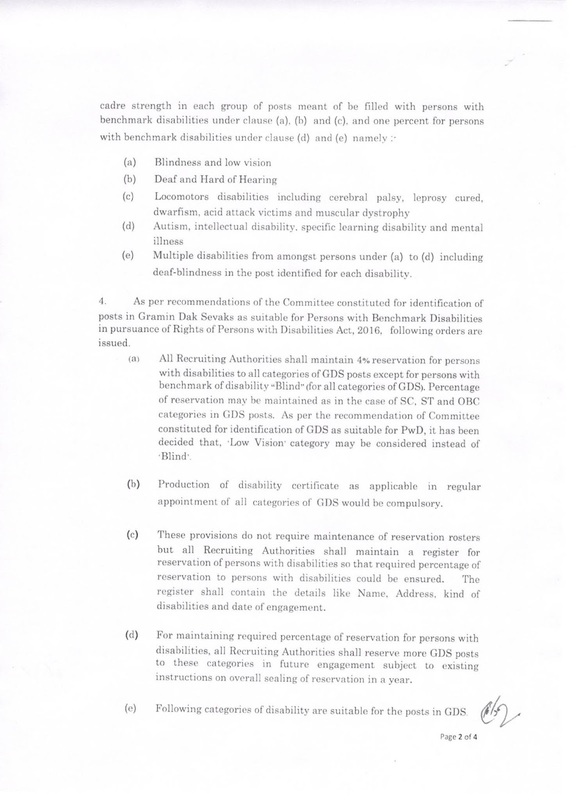 For removal of doubts, it is clarified that the above said modifications will be effective from 30.07.20 14, i.e. from the date of issue of the said OM.